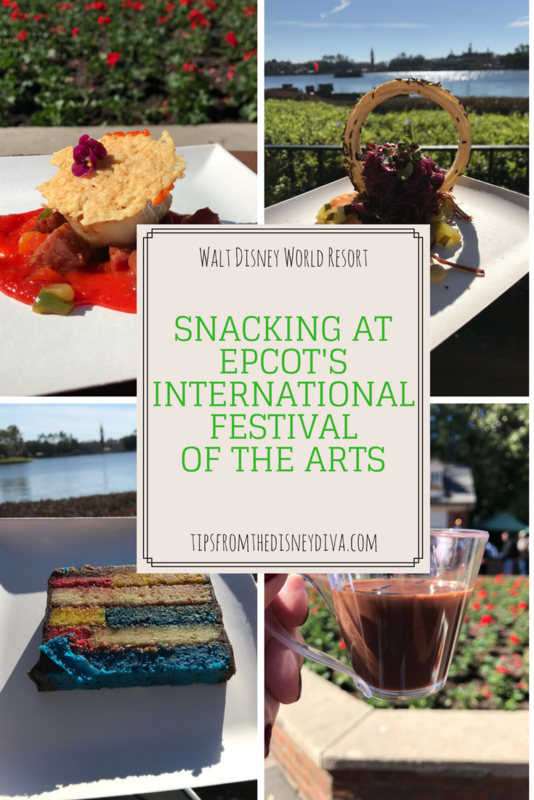 We just returned from a visit to Epcot’s International Festival of the Arts, and boy, we may never eat again! While the Festival offers an unbelievable selection of visual, performance, and culinary arts, we were there to mostly focus on the food. 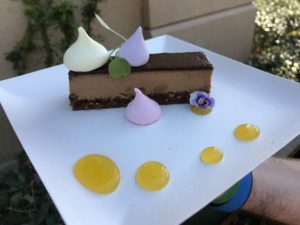 (Because we all know calories don’t count at Disney, right?!) 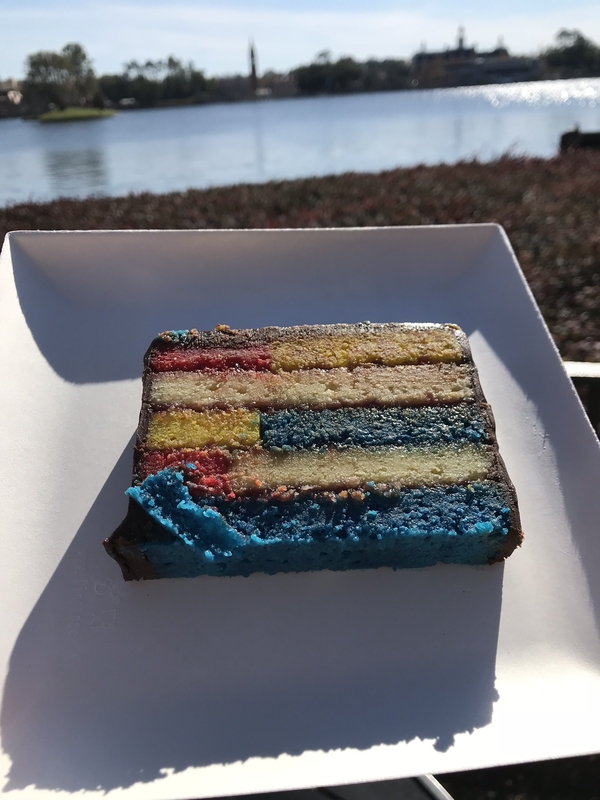 There are so many scrumptious tastes and treats to explore as you wander around the World Showcase. Just take a look at what we enjoyed! 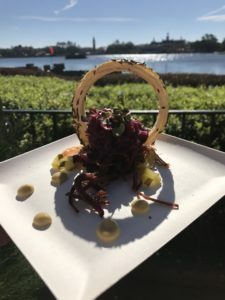 We started at The Deconstructed Dish, just to the right as you enter Showcase Plaza from Future World. I’m a big fan of Reuben sandwiches, so I was anxious to try the Deconstructed Reuben. Like any Reuben, it has Shredded Corned Beef and Thousand Island Dressing. But this one had Pickled Red Cabbage and a Rye Curl instead of just ordinary cabbage and rye. It was as delicious as it was beautiful! I was a little worried about the cabbage being bitter, but the flavors all combined perfectly. The Rye Curl was so flaky and light – a big hit with everyone in our group! Next it was past Canada and United Kingdom, although we were tempted by several of the beverage choices and some of the food options. We were trying to limit ourselves to options which qualified for snack credits, though, and wanted to be sure to make it all the way around the Showcase without needing a crane to lift us out at the end of the afternoon. Our next stop was France, where we tried the Saumon en Croute Facon Paul Bocuse (salmon in a puff pastry crust). Wow! It was flaky, light, not at all “fishy,” and so adorable! We paired it with a Frose – frozen Cotes de Provence Rose wine with Grey Goose Vodka and Peach Puree. It was delightful! As a chocolate-fanatic, one of the items on my “must try” list was the Sipping Chocolate at The Artist’s Table in the American Pavilion. I had thought I would order the Callebaut Belgian Sipping Chocolate Flight because it was – you know – a chocolate flight! 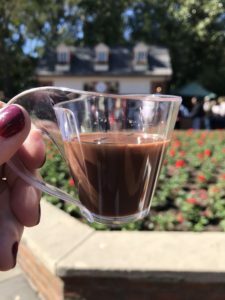 But when it came time to order I made a last-minute decision to try the alcoholic version of the Sipping Chocolate which had Chambord, a raspberry liquor. I was a little shocked at the size of the cup I received considering the $9.75 price tag. But it was phenomenally delicious – rich, smooth, dark chocolate with just a hint of raspberry. And although the cup was tiny, it was more than enough to let four of us all have several sips each. We also ordered the Pan-seared Scallop with Chorizo, Roasted Red Pepper Coulis, and Parmesan Crisp. This is one of several gluten/wheat-friendly options available at the Festival of the Arts. While I’m not a scallop fan, my family said it didn’t disappoint. And the presentation was just so beautiful! From the American Adventure Pavilion, we paused at Italy to enjoy the street performers, then stopped at Cuisine Classique in Germany. The guys wanted to try some German beers, and I couldn’t pass up the Saint-Honore Tart – a Caramel Cream Tart with Caramel Glaze topped with Cream Puffs. If you’ve ever tried ANYTHING from Karamell-Kuche, you know that this is the place for delectable caramel. And the textures in this bar were so perfect. Smooth, crunchy, flaky, creamy—it had it all! The Painted Panda in China was our next stop. We wanted to try the Crispy Fried Shrimp in a Wonton Lotus Flower because we just had a feeling it would be beautiful. We were right. The wonton were perfect, and although there were only three shrimp, it was enough for a taste. 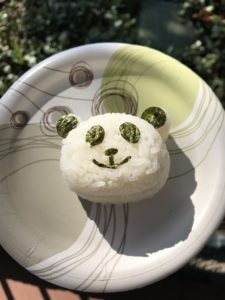 We also ordered, on a whim, the Coconut Panda Rice Cake because it was so adorable! It would be a good choice for kids – basically just white rice with a little sweetness and lots of Panda cuteness. Mexico was the last country on our world tour, and we found lots to try here. The Tacos de Puerco were probably our favorite. It consisted of two corn tortillas with slow-roasted pork, marinated in ancho paste and served with sweet plantain puree garnished with pea tendrils. The slow-roasted pork had a magnificent flavor – we were all clamoring for more! We also tried the Atole de Fresa and Mexican Concha Bread (a warm strawberry drink served with Mexican concha bread). 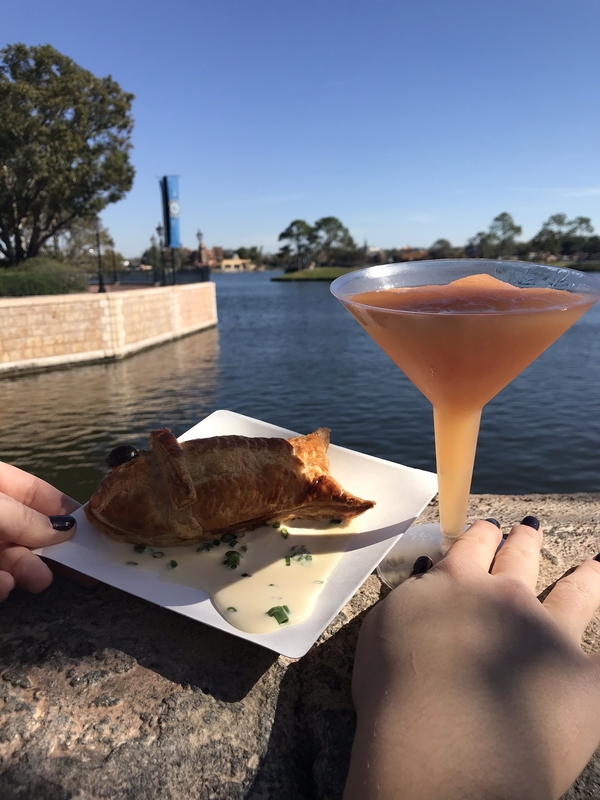 The drink was definitely warm, and we loved dipping our bread in it. The bread itself could be described as a sweet shortbread. It was a little crumbly, but tasty. We also tried the Diego Passion Margarita. 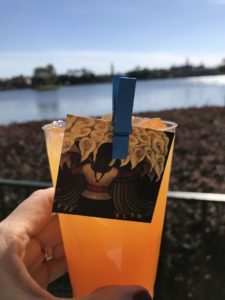 It was as enjoyable as it was beautiful – and it was served with its own piece of art! Pop Eats! was a really fun booth, and we chose the Almond Frangipane Cake. It was an excellent choice! The entire family loved it – the flavors of almond, raspberry, and chocolate combined perfectly. It was moist and beautiful, and I probably should have ordered more to stuff in my pocket for the plane trip home. A huge thumbs up! Next we stopped in the Odyssey Festival Showplace to visit The Painter’s Palate. We were starting to feel a little tired (and full! ), but we knew the cronut trio was at The Painter’s Palate inside the Showplace, and since nothing beats a cronut, we were determined to push on. 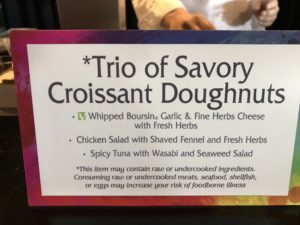 The Trio of Savory Croissant Doughnuts had received quite a bit of attention prior to the Festival opening, and we were all extremely exicted to try it. Unfortunately, while they were good, they weren’t even close to my favorite snack of the day. 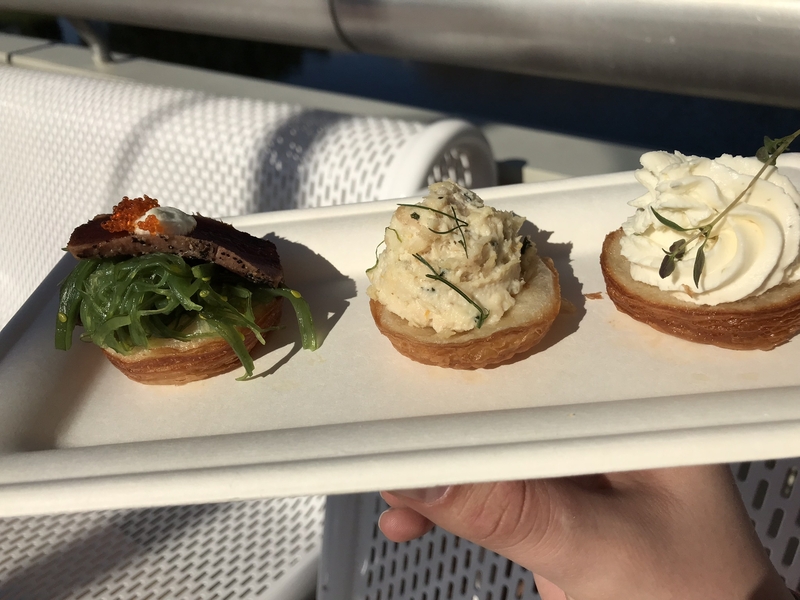 I liked the Whipped Bousin Garlic one the best, but they were all good. 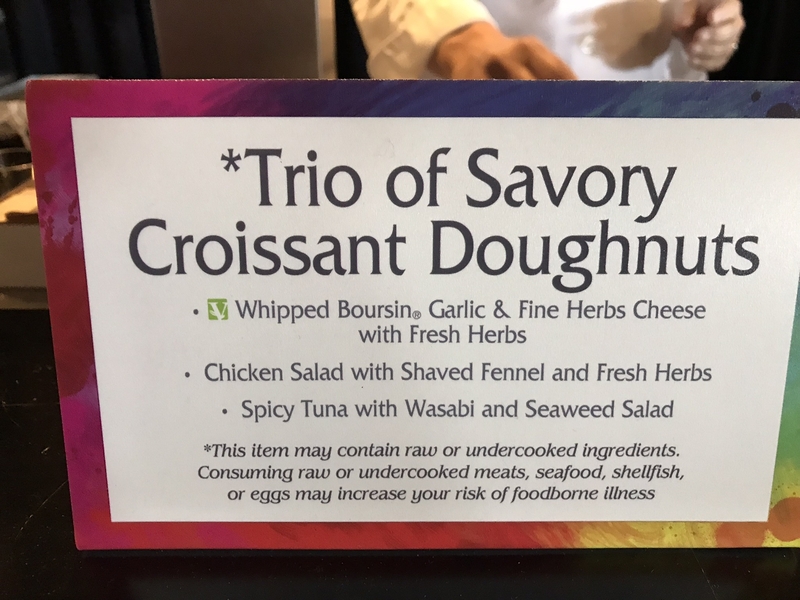 Just not nearly as wonderful as some of the other snacks we had enjoyed or as much of a “wow!” factor I get with a regular croissant doughnut. Maybe it was just the fact that we were toward the end of the day. My family loves trying new and different beers, so they opted for a Beer/ Popcorn Pairing Flight. It wasn’t printed in the Festival Guide book, but was listed on the menu board. 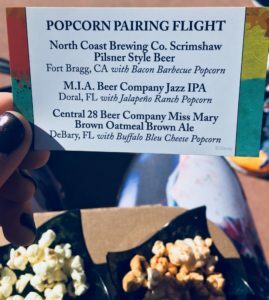 Although the popcorn samples would barely qualify as a small handful, they enjoyed all the pairings. 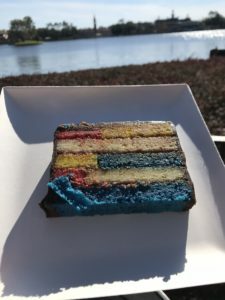 I also wanted to try the Pop’t Art (maybe you’ve seen other photos – it looks like a pop tart on an easel) and the White Chocolate Figment Puzzle on an Artist Palette. But I knew my eyes were bigger than my stomach, and we had dinner reservations at California Grill, so I made myself pass on those options. 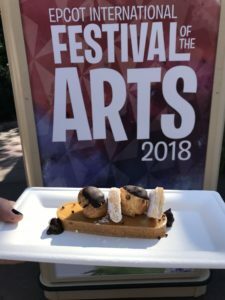 Another adorable choice was the Mickey and Pluto White Chocolate Painting with Chocolate Easel and the Festival of the Arts White Chocolate Painting with Chocolate Easel. These were packaged in cellophane, ready to give as a perfect souvenir of the Festival. But I was worried we would never get them home safely in our luggage, so I reluctantly passed. We were almost back to where we began, but had one last stop. Appropriately enough, it was Decadent Delights. By now we were almost ready for that crane to hoist us out of the park, but we managed to devour the Chocolate Caramel Mousse Bar. Chocolate. Caramel. Need I say more? Obviously we had a magnificent time! 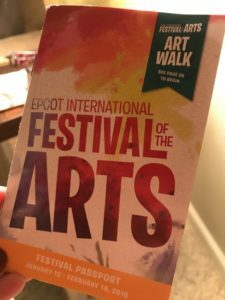 I would highly recommend attending Epcot’s International Festival of the Arts. The Festival runs until February 19, 2018 and includes so many more things to do than just eat. There are excellent workshops, seminars, interactive activities, special photo opportunities, live performances, Broadway concerts, galleries, art walks – the list of options is almost endless. 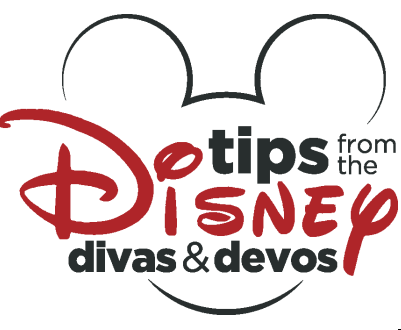 Many of the snacks are eligible for a snack credit on the Disney Dining Plan. You can find some great values by using your snack credits here. For example, the Salmon Puff Pastry in France is $10, but qualified as a snack credit. 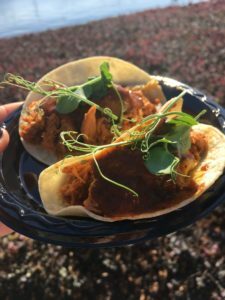 The Tacos de Puerco were $9.95 – again we used a snack credit. We happened to be on the Deluxe Dining Plan for this weekend trip (which gives each person 3 table service meals and 2 snacks per day). There were 4 of us snacking, we had a 2 night stay, so we had the potential to use 16 snack credits. More than enough to let us sample whatever we wanted without feeling like we were breaking the bank! 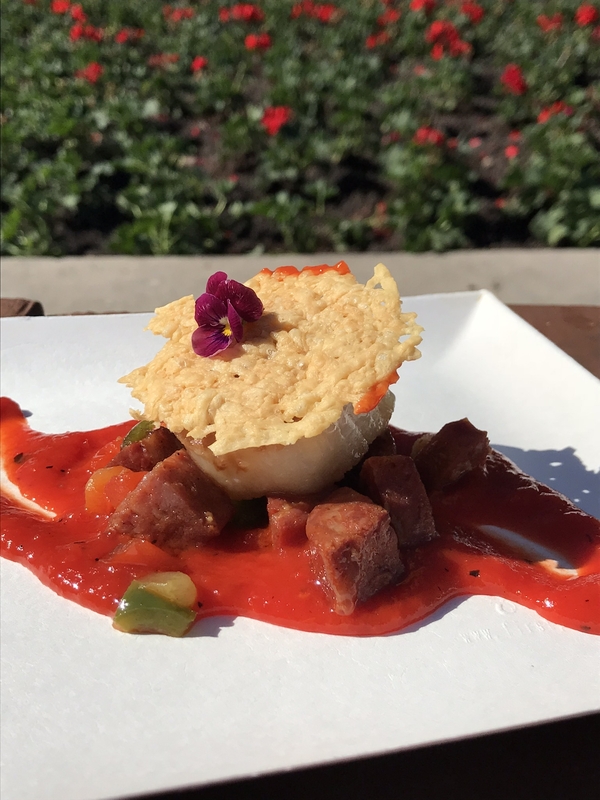 Don’t be afraid to try new dishes! My family tends to be much more adventurous than I am, so they were quick to order things I can’t even pronounce. I tried (most) of it. And usually, I found it to be delightful! It’s a great opportunity to try something new! No need to arrive early. 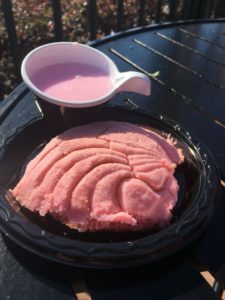 There is not much available as far as snacks go at the Festival until the World Showcase opens at 11:00. 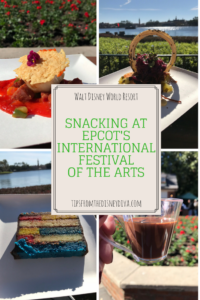 So if you arrive at rope drop, hit up the attractions in Future World and then you’ll have all afternoon to enjoy the Festival of the Arts snacks. Are you hungry yet? If so, give Patricia at All for Dreams Travel a call, and she will help you plan the perfect trip to enjoy the snacks (and everything else!) 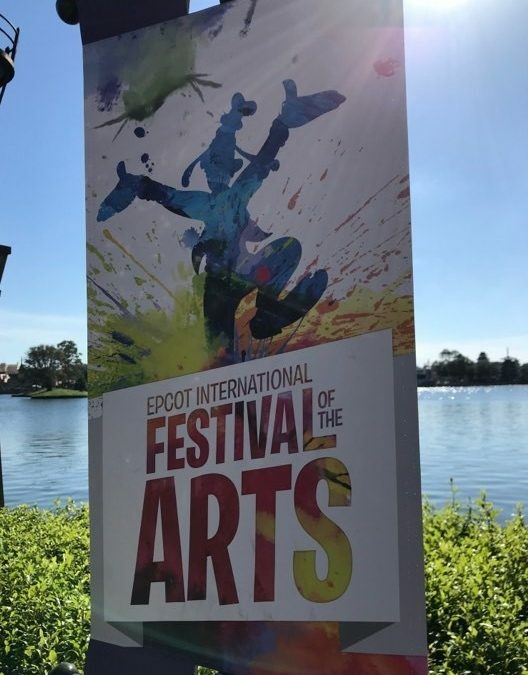 at Epcot’s International Festival of the Arts!